There’s more than one way to accomplish most goals- You can get past a sentry by casting a spell to put him to sleep, freeze him in a block of ice, take a potion to make yourself invisible, or even just teleport him to a distant land… Any of these will get the job done, it just depends on where your strengths lie and the details of the situation. Similarly, if you, say, wanted to experience being on fire, but not actually suffer any damage from it, you might opt for a creative solution that doesn’t involve as much smoke and singed hair. For instance, you might make food that is exceptionally hot… which is what I did! I was having some nasal congestion and not feeling all that great, and really thought whatever bug I had would be vastly improved if I could just burn it out! Usually a steamy shower and some hot tea do the trick, but I thought that a spicy soup might satisfy my needs for something warm, something spicy, and something very filling to sate my cold-medicine/potion hunger! Lentil soup doesn’t always sound incredibly interesting, but it is very satisfying and versatile when prepared with a little imagination! Many recipes rely on sausage for flavoring, which can make the soup too greasy or heavy. Others use mostly onion, which is fine, but a little light on the flavor side. I wanted to try something new- lentil soup that would cause 1d6 damage per mouthful! In a large soup pot, heat oil over medium heat. When hot, add celery, green onion, and carrot. Cook for a few minutes until tender. Add tomato paste, garlic, curry, cumin, sambal oelek, and red pepper flakes. Stir to combine, cook for a couple minutes to toast the spices. Add the can of tomatoes and chilies, bay leaves, and lentils. Cook, stirring frequently until everything is coated and starting to get dry. Add veggie broth, water, potatoes, as well as some salt and pepper, and bring to a boil. Once boiling, cover, reduce heat to low, and allow to simmer for 35 minutes. Remove lid and add kale in batches to the soup. Stir constantly until kale wilts, then add the next batch. Serve hot! Enjoy! 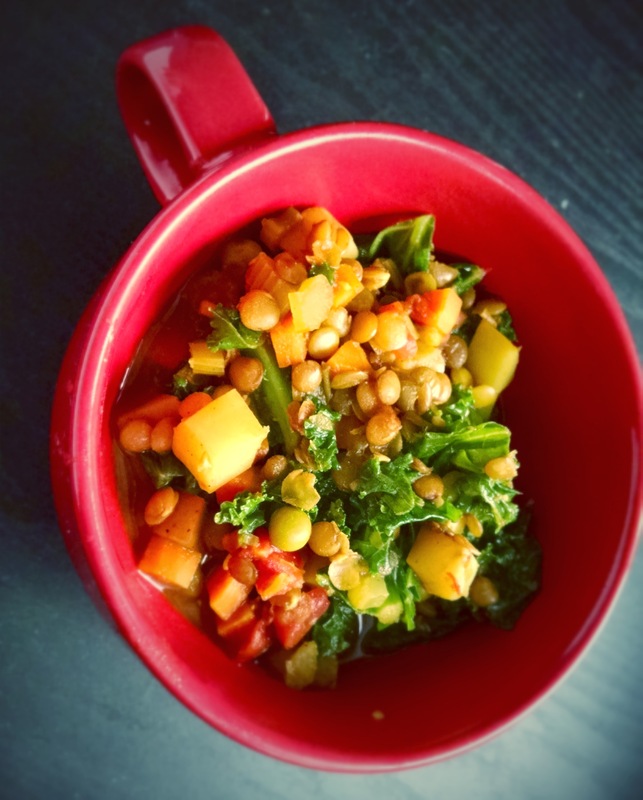 This entry was posted in powerful & potent and tagged Hot!, Soup, spicy, vegan, Veggies. Bookmark the permalink.